Logan and I always try to hit up a vibey juice & smoothie bar when we’re traveling. Raw foods help us acclimate and reset. Not to mention hydrate. Sometimes (usually) we end up in places that inspire me to make a zillion raw treats. E.g. I got the inspiration for this smoothie while I was in Seattle this past September. One morning we ambled over to Thrive, looking for a breakfast to ease our upside down bellies. Thrive is a tiny raw vegan spot obsessed with superfoods and dense nutrition. And, as we discovered, really badass flavor development. We tried a bunch of different foods — bowls, juices, smoothies, treats. But the thing that really stuck out in my mind was their raw caramel apple smoothie. One sip and DAMN. It’s been stuck in my head ever since. I resolved I had to recreate it when I got home. And only now have I found the time to test out my own version. 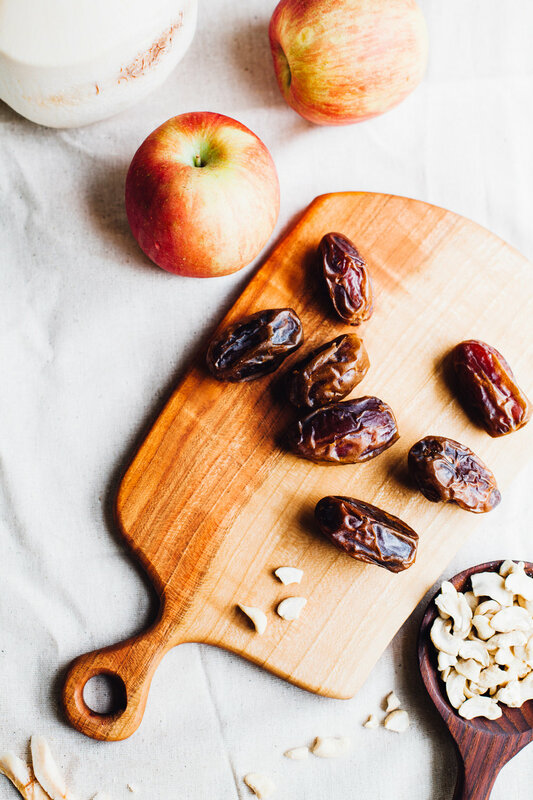 The core components of this decadent smoothie are: raw coconut meat + coconut water + apples + dates + cashews. It’s pretty freaky how similar it tastes to a caramel apple. It’s one of those things that makes you go whaaaaaaaaa??? And, despite the heavy dose of coconut meat, I think it tastes more of apple and sweet dates than anything. Raw coconut meat tends to taste less intensely of coconut than desiccated and matured coconut. It’s more of a clean, light and sweet coconut flavor. So it blends seamlessly into the overall flavor. It’s up to you, but feel free to get creative with superfoods here! I personally love to add lucuma and maca, both of which blend well into the overall flavor of the smoothie. If you don’t mind a color change you could add spinach, spirulina, or turmeric powder. For a protein boost, you might add hemp hearts or your favorite vanilla or neutral flavored protein powder (Vega is my favorite). 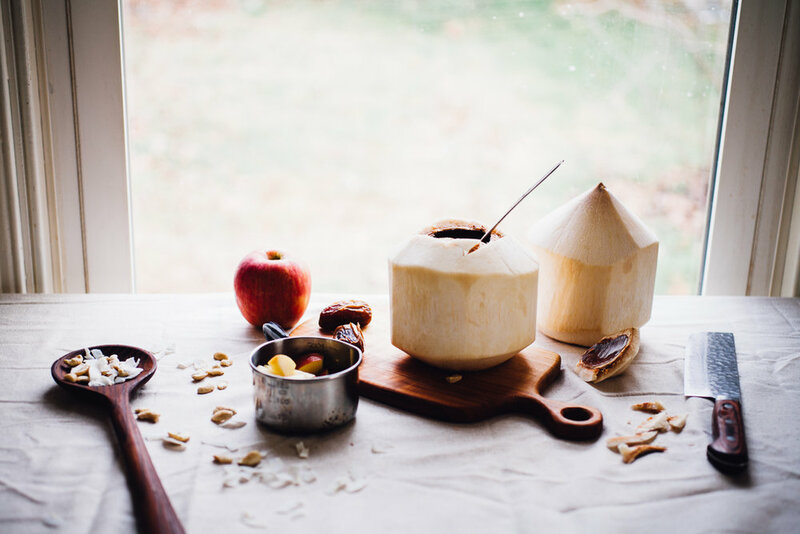 One of the major benefits of a coconut meat & water based smoothie is hydration. If you’re starting to feel that dry heat of Winter getting to you, this smoothie will perk you right up! Plus it’s not based in frozen fruit so it won’t chill you to your core. Another benefit: it’s a digestive aid. If you’re overwhelmed by slow digestion (perhaps the result of lots of dry, cooked food) this smoothie will fix you right up. Not to be GROSS but… it helps you poop! Yes, I am talking about poop and food all in one blog post. Just being real, my friends. I mean, we all do it. We all need good BM’s. Let’s celebrate and activate healthy colons with delicious smoothie joy! Don’t let the coconut chopping intimidate you. It’s like riding a bicycle. A messy, delicious bicycle. Once you’ve done it successfully you’ll get the feel for it. It’s really as simple as whacking the top of the coconut in a circle until the top loosens and can be wedged off. But big knife + chopping motion = scary. So be sure to work with care in an environment clear of limbs (yours and other peoples). You'll need a sharp knife -- a chefs knife that can take a beating, a large chopping block or cutting board, a large mesh sieve, a medium bowl for the coconut water, a bowl for the coconut meat, a sturdy metal spoon and a damp dish towel. In lieu of repeating things on the internet, follow Laura's step-by-step guide on how to open a Thai coconut. It's very thorough and she photographed the whole process from start to finish. Also if you don’t follow her blog what are you even doing with your life. You can always open your coconuts in advance to save yourself some hassle. I like to buy three or four of these bad boys and hack 'em all open at once. It saves me from multiple clean ups. Plus I like to store the water in the fridge for daily drinking (read: guzzling). I freeze the coconut meat in ziplock baggies. Which brings me to my next point! If you do happen want your raw caramel apple smoothie super cold, you might want to freeze your coconut meat first. OR you can always add an ice cube to the smoothie before blending. 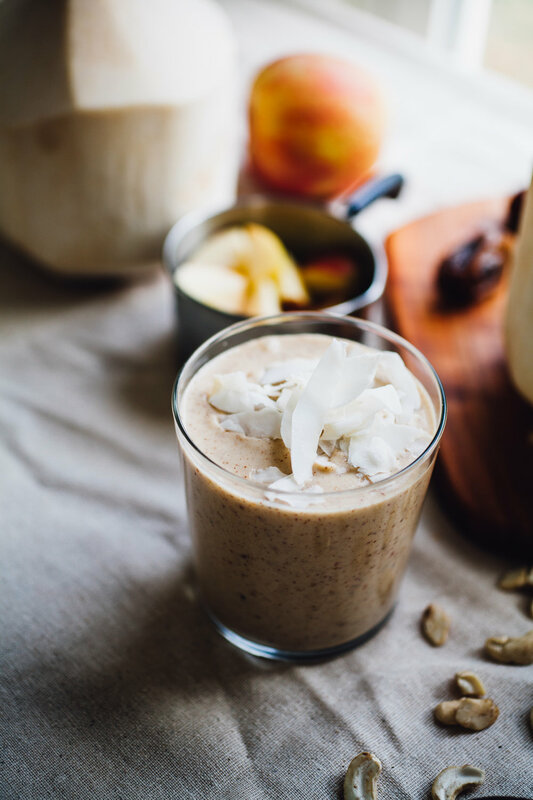 This raw coconut apple smoothie is creamy, vibrant and decadent. And it tastes just like a caramel apple! Don't worry too much about exact measurements for the coconut water and meat. You'll want to use everything that comes out of your coconut, which is usually about 1.5 cups water and 3/4-1 cup meat. In the bowl of a high powered blender, combine all of the ingredients: raw coconut water, raw coconut meat, almond butter, apple, dates, cashews, vanilla extract and (optionally) maca and/or lucuma. Blend on high until the smoothie is creamy. Serve immediately.